Experience the best of Pushkar Fair holiday with India's best Golden Triangle tour package. 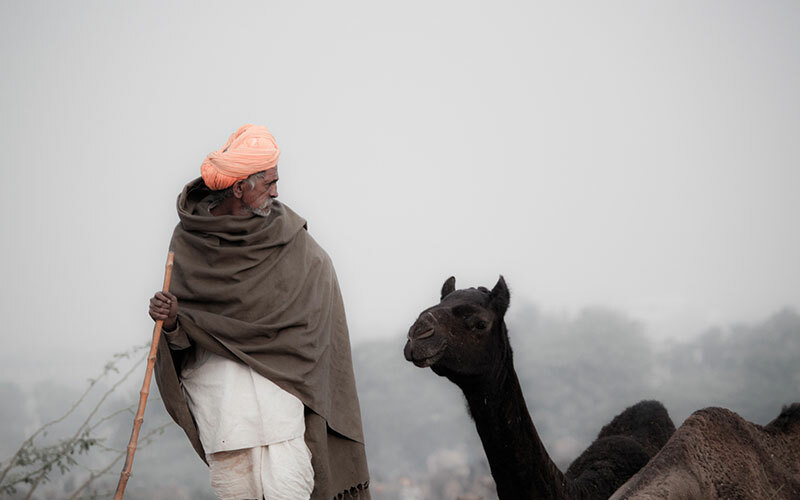 Held every year for nine days the Pushkar Fair (Pushkar Camel Fair) at the holy city of Pushkar is the largest livestock festival in the world. An important cultural event of Rajasthan, the Pushkar Fair holiday is fun and frolic filled and an astounding spectacle of Indian countryside. It is thus also an important centre of tourist attraction for foreign visitors who come here every year in large no. from all corners of the world. Started at a religious node by the Pushkar Lake, the festival according to hindu calendar it is celebrated between the five days from the Kartik ekadashi to Kartik Poornima, the full moon day (the 15th) of Kartik (October–November) according to Hindu calendar. The full moon day is considered as the main day of the festivals. 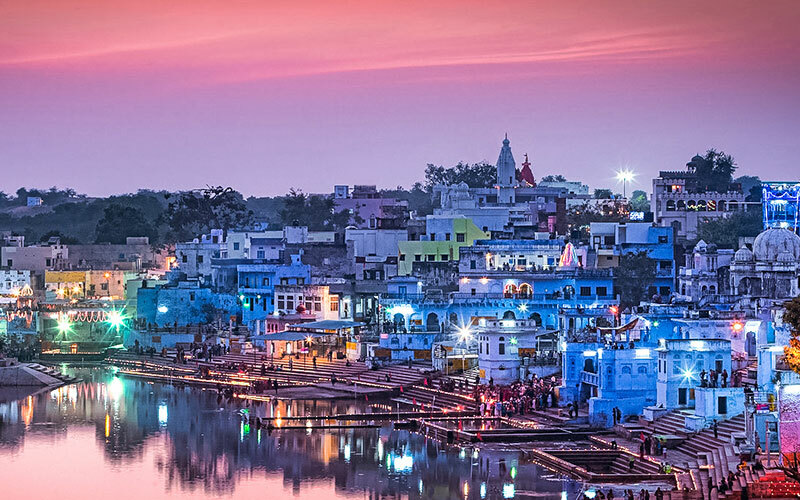 According to Hindu beliefs on this day, the Hindu god Brahma sprung up the Pushkar Lake, thus numerous people take a holy dip in its sacred water. On arrival meetings and greetings at Delhi International Airport then transfer to hotel for check in. Overnight stay at hotel in Delhi. Early Morning transfer to New Delhi railway station to take a Superfast train to Ajmer. On arrival take a drive of 16 kms to Pushkar from Ajmer, which is home to the only temple dedicated to Lord Brahma. Pushkar is one of the oldest cities in India, located to the northwest of Ajmer. It is said Lord Brahma the creator of the Universe dropped a lotus to the ground for immediate creation of a lake, so he decided to keep the place name after the flower, thus the Pushkar name came up. Overnight stay at hotel in Pushkar. Now finally the most important day has come to see the colourful Pushkar Fair. Pushkar Camel Fair or Pusklar Mela as called by local people is held every year for 8 to 9 days in the month of October-November at the time of Kartik Purinima full moon. On this day people from different parts of the world travel to this place mostly for cattle trading, most importantly around more than 50,000 camels throughout the world are gathered at this place. This fair can be classified into three parts first is The Cattle Fair – apart from the camels there are many other animals as well which are traded here like horses, cows, sheep and goats. The highlight of the Fair is competitions among the colourfully decorated camels and a prize is given to the winner of the contest. Second come The Cultural Fair – the stalls and shops in this fair cater things to both humans and cattles, here you can find many cultural activities going like folk dance, puppet shows and so on and also can shop Rajasthani traditional Jewelleries, clothing, especially designed tattoo which carries an ethnic charm with a typically Rajasthan aura. Here comes the third and the last day for a dip in the holy water of the Pushkar Lake the Kartik Purnima day or Full Moon day. It is said those who bathe during full moon they receive special blessings from the Gods. Overnight stay at Hotel in Pushkar. Morning breakfast at Hotel. You have full one more day to enjoy the Pushkar Fair as there are many activities which takes place on day to day basis in a scheduled way. Names of the various activities are for example the Longest Moustache competition, Hot Air Balloon ride, Indian Bride competition, and many more. Overnight stay at Hotel in Pushkar. Morning breakfast at hotel then drive for Jaipur. 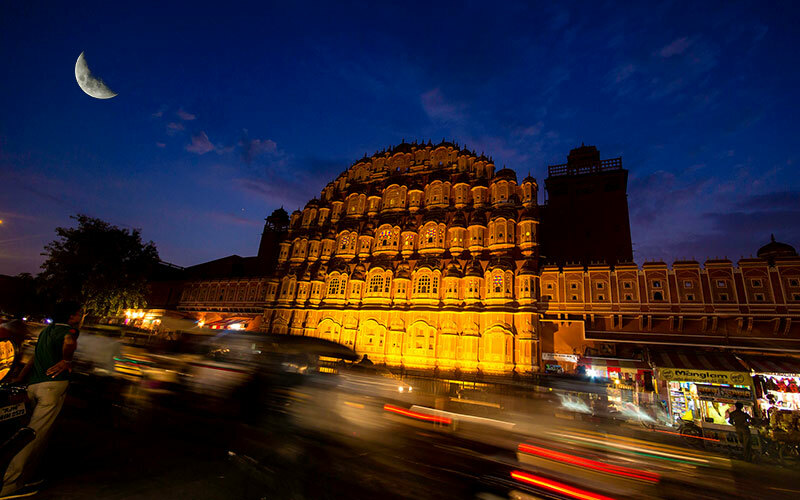 Jaipur referred as the pink city of Jaipur due to pink colour on the walls of the city. The Maharaja Ram Singh of Jaipur painted the whole city pink in the honour of The Prince of Wales and Queen Victoria travelling to this place, as pink colour denoted the colour of hospitality. On arrival check in at a pre-decided hotel, relax yourself for some. Evening is free for leisure time you can explore the city and local market. Overnight stay at hotel in Jaipur. Today full day sightseeing of Jaipur the guide will first take you towards Amber Fort; you can reach the gate of the fort on an Elephant’s back. As you reach the gate of the fort, tour guide will give you a brief introduction about the lifestyle of Rajput Empire and history about the fort. Later on the way back to the city Photo Stop at Jal Mahal Palace, built in the middle of Man Sagar Lake. After having a short photo stop at Jal Mahal continue your drive to the city. On reaching start your city tour by first visiting the City Palace. City Palace is a residence to the former Maharaja – it is said that if there is one flag waving on the Palace it means the Maharaja is not inside the Palace and if two flags are waving together it means the Maharaja is former seated in the Palace. Later visit Jantar Mantar (the observatory just opposite to City Palace), also visit Hawa Mahal which was used by the ladies of the palace to see the outside world. Overnight stay at hotel in Jaipur. Morning breakfast at hotel then drive for Agra. 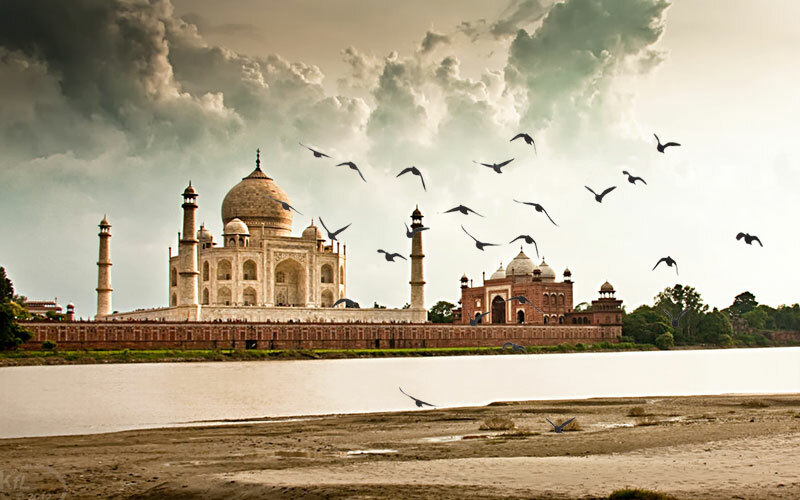 Agra is home to the Seven Wonders of the World the beautiful Taj Mahal. The city is situated on the banks of river Yamuna. The Mughal Emperor Akbar chose Agra to be its capital. Enroute sightseeing of Abhaneri Chandbaori Stepwell and the deserted town of Fatehpur Sikri. The Chandbaori Stepwell is said to be the largest throughout India. The Chandbari stepwell was used to conserve maximum storage of water. Then sightseeing of Fatehpur Sikri which is just 30 kms before Agra, take a battery van ride to reach the entrance gate. Also give a visit to the Buland Darwaja (the highest gate in the world). Later continue your drive to Agra. On arrival check in at hotel, overnight stay at hotel in Agra. Early morning sightseeing of Taj Mahal, a dream visit to the marvellous monument the Taj Mahal denoted as the symbol of love with is situated at banks of river Yamuna. Take a Tonga Ride (horse cart) from a distance to Taj Mahal. The guide will explain you deep history about this architectural monument. Come back to the hotel take breakfast then continue with the left over sightseeing of Agra. A visit to the Agra Fort also referred to as the Red Fort of Agra is a red sandstone fort. After sightseeing proceed for Delhi, on arrival straight transfer to Delhi International Airport to board departure flight. Elephant ride, Camel Cart ride, Tonga ride.